Travel with Kevin and Ruth! : Colombia - More negative than Mexico? It's like our experiences in Mexico. I added it up, and we have spent a total of 28 months touring Mexico. Yes, almost two and a half years in a country that many Americans and Canadians won't set foot in because it's "too dangerous". Other than one bad experience when we got mugged in Zacatecas, we have never had a problem. In fact, we haven't even seen anybody having a problem. And this isn't because we were holed up on a resort or behind the walls of a gated expat community. We were actually out there exploring most of the time. So how is it that we avoided all of that danger? Well, maybe because it's not quite as dangerous as people think that it is. And apparently Colombia suffers from the same misconceptions. Back in the 1990's, Colombia really was a dangerous place. In fact, the city of Medellin was listed as the world's most dangerous city. A place where several car bombs per day exploded as Pablo Escobar's cocaine cartel went to war with the government. And the rest of the country was embroiled in a civil war where kidnapping and murder and armed conflict were common. But two decades later, Colombia is not the same country. In fact in 2013, the city was named "Innovative City of the Year" by the Wall Street Journal. And there are many recent articles regarding the reinvention of the city. 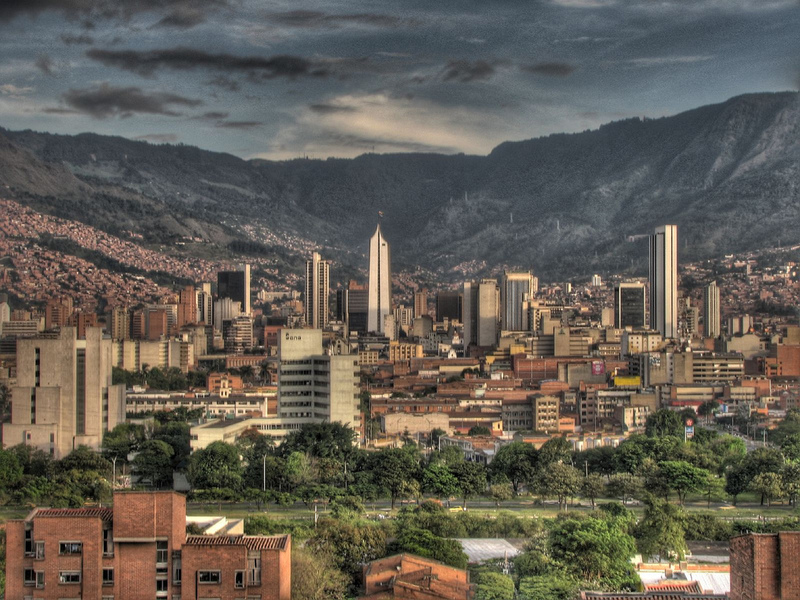 Tourism has blossomed and in fact, we're planning on spending at least a week just in Medellin itself. And of course it's not only Medellin. Other large cities worth visiting are Bogota and Cartagena. And then many smaller cities, and national parks, and beaches and coastline. Six weeks may not be enough! To make sure everyone I cross paths with visits COLOMBIA at least once! Ike was born and raised in Colombia, but now makes NYC his home. And yes, it was Ike who originally told us that we need to visit Colombia, so we're happy that he'll be following along and giving us some pointers and tips on our journey. Colombia's tourism trade is still young, and we're happy to be visiting at a time when most people are still afraid to go. But we're excited at the opportunity to tell you about a country that is trying to forget a dark time in it's past and is looking towards the future. Haven't seen anybody having a problem? How soon we forget about Tioga George's horrible experiences in Mexico---almost robbed in Hermosillo, then his two close shop buddies executed in that tiny town he was going to settle down in. We have heard a couple of stories reported by others. But we have never seen anybody having a problem. Not too interested in Amazon Prime, but I did just learn about a great new Amazon program called "Fulfillment by Amazon Small and Light" wherein certain items under $10 and 8oz will now ship for free---without the $35 minimum order! We are interested in enjoying your experiences there. We only spent 3 months in Mexico and never felt unsafe at anytime. Thanks George, we are looking forward to our experiences there as well. We believe that for the most part Mexico is a safe place but like anywhere else you need to be aware of your surroundings and don't do stupid things. Bad things can happen anywhere. We did have an experience in a Grocery store in Mandeville Louisiana where a bank robber came in and tried to cash in some money and had die on his hands, Police arrived with guns drawn and we were all told to take cover behind the meat counter at the back of store. At least there was no shootings. I remember reading you post about that, and that just goes to show people that it is just a matter of being in the wrong place at the wrong time. Glad that you stayed safe in that experience. I would definitely go to Columbia - I am far more scared in the good old USA (I was born there FYI) than anywhere else in the world. That includes places like Egypt and Turkey and Mexico. I'm not even sure how to respond to that. So I don't think I will. I've been wanting to chip in on this since you first announced it. Think the blinders need to come off guys. Geoff you should know us well enough by now that we don't just jump into things with our eyes closed. Kevin has done lots of research and we have talked with people that have visited there and have loved it. We feel that it is no more dangerous than Mexico or many other countries. We are responsible travelers and heed warnings from locals to stay away from certain areas just like you would have to do in cities and towns for that matter in the U.S. As we have said before bad things can happen anywhere and everyone takes a risk every day as soon as they wake up in the morning. My philosophy on warnings is to ask the one who is offering the warning whether they've been to the place they are warning about. If the answer is 'no', then I ignore them. Very well put Kathe K! I've been to Cartagena, Bogotá, Medellin and Cali. In the late 90s I walked around the streets of Bogotá at night, went to a public park to see an exhibition of art, bought some Colombian handcrafts in a neighborhood nearby. I remember that night well, beautiful moon, cool weather, and very friendly people. All out walking the streets. Same with Peru, Ecuador, Chile, well you get the idea. Breaking paradigms is hard to do. Only you can know the truth by judging for yourself, in person, and with local people. That said, you're going to amaze a lot of people here on the blog and they will walk away with new knowledge. Can't wait to read about your trip. Thanks Chris, we are looking forward to reporting back to everyone. What you have describe is much like what we have heard from other travelers that have visited there. There will always be people that don't want to step out of their comfort zone and think that others shouldn't either but that is want explorers do. Imagine what the U.S. would be like if all those explorers and pioneers never went further than the area where they got off their boat! And yet those naysayers don't stop to think about all the crime and problems in the USA? hmmmm any big city has it's share of crime, no matter if it's north or south any border. Sigh. I live in a big CA city...and know I would have a "problem" if I went into certain areas of this town..Tourists are robbed... and worse regularly....Do your research no matter where you travel. and...my US neighborhood p.d. doesn't take bribes...like George (and others) were subjected to in Mexico. You are exactly right Karen and you need to be cautious just like you need to be alert and cautious everywhere that you travel. Doesn't matter where you live or travel the same rules apply. I guess you can be anywhere at the wrong time....even in USA to experience crime. Biker shoot out in Texas...nine people died, rioting in Baltimore, sometimes things happen that you were not expecting. Can't be afraid all our lives...heck we drive out every day not knowing if we will be hurt in a car accident, road rage, etc...but we take the risk. You are totally right Rita, we can't be afraid all our lives, if people were they would not want to get out of bed in the morning. Nobody knows what will happen each and every day. There was a man killed in Regina in the middle of the day in a parking lot of a Giant Tiger just the other day, this is only two hours away from us. Does this mean that we shouldn't go to this city, this store because it is dangerous. We were in the parking lot of a Walmart in Cottonwood only days before a man died in a shotout. All anyone can do is to try and know their surroundings, be aware of what is happening around you and don't do stupid things. We do all this when we travel plus we carry very little with us when we are out and about so that if something were to get stolen they wouldn't get much just like when we got mugged in Mexico. The world is out there to see and we intent to see it, glad that you see it our way. The news almost always tells you the bad things, they don't tell you the good things that happen. We think that more good happens than bad but people only what to believe the worst. Yep, every city and town anywhere in the world is the same. We will try to remember the Gold Museum but you may have to remind us again when we get closer, although I am putting on my list. Glad that you enjoyed you visit, I bet things have really changed since 1978! I have read reports by other bloggers who've traveled to Colombia. It is a beautiful and progressive country now. I think many people remember the bad old days and forget that things can and do change. We also have read many other bloggers posts as well as talked to people who have visited and they have all loved it and raved about it. I think you are right about people remembering the bad times, cities and countries can change over time, just look at NYC for a good example. I think new travelers not understanding where they are going or do stupid things while they are there may have issues in a place like Mexico or Columbia. But you don't wear flashy jewels, you don't make friends with people that are into drugs, you are careful about where you go and research well. I think you will be fine. I would be far more worried about people that didn't have as much travel experience behind them. The most important thing about traveling above all else it to do the proper research! Having said that, that won't keep you safe but it does help. We know that things can happen and do happen but they can happen anywhere. We aren't going to sit in a plastic bubble all our lives. Thanks for your vote of confidence in us, Karyn Lee. My husband and I have driven all over Mexico without any trouble. Now I go on my own and no problem. Yep, you are right Jan! We know that just because we haven't had any major trouble that there isn't trouble out there but we won't let that stop us from visiting either Mexico, Colombia or just about any other country. I think the people that say don't go are the ones that wouldn't go anyways. We are doing the research and we are going to have fun, thanks! Thanks Shadowmoss for you point of view. We would like to visit Honduras and one day we will. We are like you, we try hard not to stand out and make ourselves a target. We try to adapt as much as we with the local population. We agree that most of the time when people do have a problem it is because they do stupid things like going out and getting drunk and then stumbling out into the streets with cell phone in hand at night or trying to pick up the wrong girl, going home with the wrong guy. People need to be careful, we realize that this doesn't make you immune to trouble but it certainly helps. Your going to enjoy Colombia and the people are some of the friendliest. They love a good time,they don't have much,but doesn't stop them from enjoying friends and family. Hope your up for late night dinners9best food) and some beautiful dancing. Colombia is not what it used to be for sure. They are proud people and love to entertain. They want good reports so that others come to enjoy the country. Oh gosh, I think I just talked myself into coming along with you. Look forward to lots of pictures and maybe a map of the directions your planing to follow. Thanks Valarie, we are pretty sure we are going to love it too! What you have described is pretty much what we have read from other bloggers that have been there as well as talking to others face to face that have been there. Go forth and explore for the rest of us!!!!! Still, one day is better than no days! Now you have an idea of what Colombia is like, a small one albeit but one none the less, now all you need to do is start planning a visit there for a longer time. First impressions can tell a lot about a place. My husband and I have traveled the world for 40 years, Singapore, Vietnam, Thailand, Mexico, Indonesia (where my husband and a co-worker were "kidnapped by a taxi driver" but made it back safely) and many other places (u.s. included). We knew there were/are risks...but we still had fun. However we still warn others to "be careful". So..have fun in Columbia...maybe post more travel safety tips you have learned. If that was "truly" your intention then you used the wrong words and a lack of judgement in trying to get this point across. Putting us down as "innocent" travelers and putting a country down that you haven't been to or if you have, then it was not recently is just wrong! We are not naive and go into something without doing the research first. We know the risks and they they aren't that much different from risks that everyone takes everyday. I do believe that we have done a post on safety tips that we use but we can do that again sometime, also depending on the country they can change slightly. I'm sorry if you thought I was talking about you..I wasn't..I was talking about new travelers who might read your blog and don't know how to plan and travel safely. I'm also sure most of the people in Columbia are great but the risks are there from the bad ones and knowledge is part of travel preparation. I spent 10 days in Col-O-mbia back in 2011 as a solo female traveler. I had a wonderful time and felt very comfortable. My only regret was not being able to stay longer, since I was working full time back then. Thank you Suzanne for your positive input, I hope that you will be able to return to Colombia so that your can see and experience more of the country. We are hoping to stay at least a week in Medillin so I am sure that we will be checking out the Metrocable as well. The city sounds really interesting. We will look into renting out a basic tent at Parque Tayrona, I believe it is on our list of place to visit while we are there. If you have a chance, check out sanpedroscoop.com's posts about her visit to Colombia. She, like you, is a smart and seasoned traveler, and loved it! I have wanted to visit ever since I read her blog posts and know you will do just fine, as you always do. You are smart travelers who do their homework, and although bad things can and do happen everywhere, they are much less likely than most fearful people realize. We lived in Belize for 18 months with no issues and in Mexico for 6 months, also with no issues. Don't do drugs, hang out with drug dealers, walk the streets drunk in the middle of the night, etc... and you'll be fine. Thanks for the link Emily, we want to read about other people's experiences there and also to see where they have been and if we think it is also worth it to go to some of the same places. Everyone that we have either spoken too or read their blogs seems to have loved it there. They also say that Colombians are some of the most friendliest people they have met. Yep, your advice is exactly what we follow as well and have always had good experiences just about everywhere we have traveled because of it.